Sometimes buying the simplest little things, whether it's long housecoat or even slippers turns into a living hell. How to buy the right? Yes, comfort is important.. Especially at home - the only place where you want to just warmth, comfort and tranquility. But imagine for a moment that you live not alone but with a husband or boyfriend. Do you want to see the love and passion in hisI look every day, and you deserve it! But in his shirt over his naked body every day will not cut and plush pajamas is not quite what to configure your hero's feat. < p dir = "ltr"> And, of course, discounts! You do not need to spend all day on the exhausting race shop. Like the commodity will drive up to your house, right in the hands. The solid pros, but you probably already know all about shopping online. Let us closer to interesnenko. 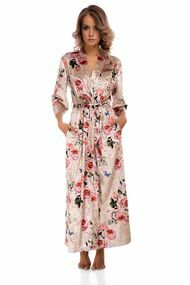 How to choose a long housecoat? There combed cotton - its key advantages of this extraordinary softness and elasticity. Mikrokotton - this material is an excellent absorbent. It absorbs moisture and odors, and very much like athletes. But if you need a coat? That's all wisdom. Use the illness and enjoy a brand new, perfectly matched bathrobe!